I love to see the Left eat their own. 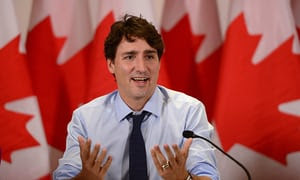 According to Breitbart, in a recently resurfaced editorial, Canadian prime minister Justin Trudeau appears to apologize for “inappropriately handling” a young journalist nearly 18 years ago. According to the Creston Valley Advance, Trudeau told the young woman: “I’m sorry. If I had known you were reporting for a national paper, I would never have been so forward. Trudeau, a champion of the #MeToo movement, penned an essay in 2017 urging parents to raise their boys as feminists, notes Breitbart. I just assumed he was gay.